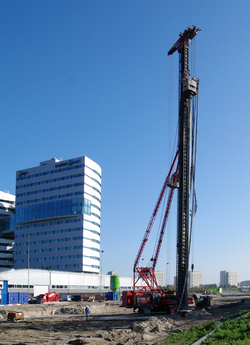 In the Amstelkwartier residential area, Vroom Foundation Technology has realized 3 projects in a row for which vibro piles, DPA piles and VGS grout injection piles have been realized. As a part of the LEAN project of Waal Bouw, the submerged basement was something special. The new Amstelkwartier residential area is the first to be developed in the Overamstel area with the first stage resulting into the construction of 1,500 homes, a floor surface of 5,500 square meters for jobs and shops, a hotel, a day care centre and a school. Inside a part of the ground-level spaces, it will be possible to house companies. 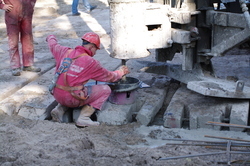 On the long side of the strip where three projects are being realized, there is a number of underground main pipes belonging to the public utility companies. 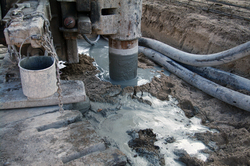 Near this zone, for the purpose of plan 4A, cast-in-situ low-vibration drilled VGS piles with grout have been produced. 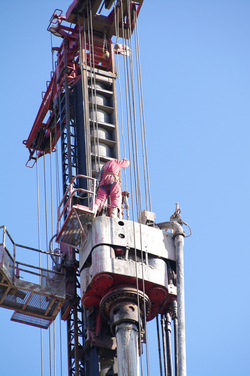 The rest of the foundation consists of vibro piles. 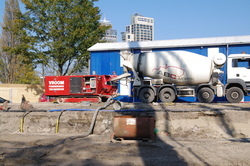 Van den Boogert: “It speeds up the process once you know which parties are being involved into the realization process so that before the construction activities begin, knowledge can be exchanged and adapted.” The ideal situation occurs when construction team partners are already being involved into the project during the design stage so that they can share their practical experience and expertise with each other. Constructive aspects can directly be adapted to each other as possible alternatives are being suggested and calculated. 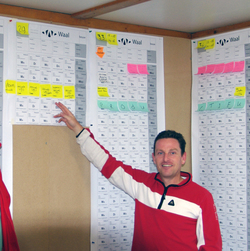 “An efficient solution, essentially, does not always have to be the cheapest one.” A LEAN project does not include the term ‘to be decided later’. 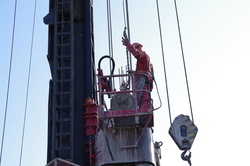 This is also an advantage for the client as after all, the LEAN principle leads to a faster and more efficient construction process as the failure costs are being reduced. 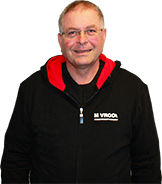 “Secondly,” Van den Boogaart analyzes, “it relieves me from a lot of arranging activities as parties discuss with and respond to each other themselves as for the aimed framework and deadlines.” Parties can figure out a lot themselves, and with each other. 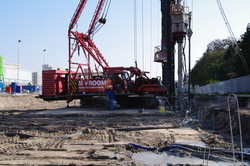 A third winning element is that few supplies will be present on the building location, but that will occur more often in the later stages and not during the building process carried out by Vroom Foundation Technology. 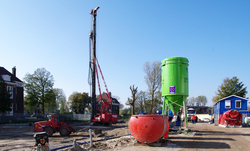 For this project, we have used a submerged basement with the basement floor missing. The basement walls have been connected to each other on-site as they have been stabilized with braces. 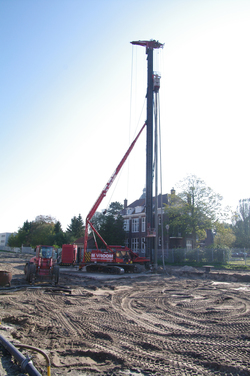 In order to position the basement on the correct depth level, the building excavation has been dug in a controlled manner in order to have the basement submerge to the correct depth-level, free from the foundation piles. 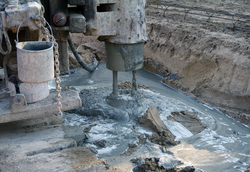 Subsequently, the pile heads have been cut and the basement floor has been poured. At a certain moment, there was a ‘wood’ of pile heads sticking out from the basement floor. 139 luxury private sector apartments for rent in 2 volumes including an underground parking garage. Inside the Amstelkwartier residential area, the city and developers are realizing 1,500 homes, an elementary school, a carbon-neutral hotel and a park alongside the Amstel river. 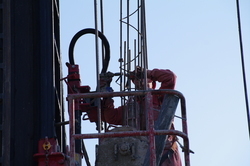 The first homes are expected to be completed in 2013. Can we help you with your project? Contact Rob Sman. Dial +31(0)299 409 542 or send us an e-mail.